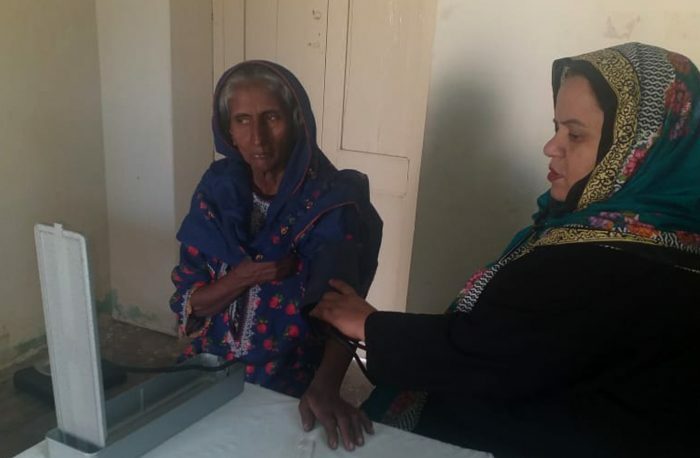 Haleema is a fifty-five-year-old mother to six children who lives in Ranta village, located in the Sujawal district of Sindh province in Pakistan. Her husband, Phul, is much older to her and has been diagnosed with severe diabetes for some years now. The diabetes has left Phul bed ridden and unfit for any sort of physical work. With no other source of income for the family, Haleema and her eldest son work as daily labourers at local agricultural fields whenever there is an availability. Through this they manage to earn up to PKR 4,000 (indicate $ equivalent in brackets) per month. Ranta is a remote village which is located at least twenty-two kilometers away from the nearest town. For many years, there were no health facilities in Ranta or in any of the nearby villages for residents to seek medical help at. The closest health centre was located miles away from these rural settlers. With the little income that families like Haleema have, it was nearly impossible to bear the costs of travel to these health facilities for any sort of medical treatment, let alone the medical fees. Haleema was suffering from high fever and chest complications. After running some tests, Haleema was diagnosed with malaria. A course of anti-malaria tablets for a week was prescribed and a follow-up visit was scheduled after the completion of the course. By the time that Haleema made her follow-up visit to the MNCH, she was feeling healthier. Dr. Shazia further prescribed some multivitamins and gastric tablets to her so that she would maintain a healthy diet. Haleema was also given a health awareness session where she was encouraged to use mosquito nets to protect her and her family from diseases like Malaria and Dengue. In addition, she was advised to follow a more nutritional diet which would increase her family’s immunity in the long-run. Haleema has been a member of the Village Health Committee and Health Management Committeeⁱⁱ since 2015. Today, as an active member of the committees, she provides counselling and builds awareness on health issues and family planning for the women of Ranta and other nearby villages. She encourages women to avail health services of the MNCH and to take care of their health which would be beneficial for the entire family. I avail every opportunity I can get to counsel women. I have shared health benefits and provided advice during social gatherings, wedding occasions and even during harvesting crops in fields. ⁱ Sustainable Development Goal 3: Ensure healthy lives and promote wellbeing for all at all ages. ⁱⁱ Village Health Committee and Health Management Committee formed under the Health project to ensure community participation, ownership and support to communities in building awareness.